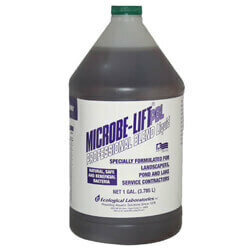 Microbe-Lift Professional is a blend of microbes that contain specifically formulated strains of bacteria manufactured for use by landscape, irrigation and pond professionals. PBL is a combination of 3 products: PL 80%, Ensure 10% and TheraP 10%. The Ensure is for plants and TheraP is for fish. Designed for professional service people so they don’t have to carry 3 bottles from pond to pond. 80 - 200 3 oz. 2 oz. 2 oz. 201 - 500 10 oz. 3 oz. 3 oz. 501 - 1,000 12 oz. 4 oz. 4 oz. 1,001 - 5,000 16 oz. 6 oz. 6 oz. 5,001 - 10,000 32 oz. 16 oz. 16 oz.